We are proud to present these awards in honor of the title professionals who understand the commitment to making TIPAC stronger each and every year. 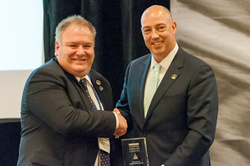 North American Title Insurance Co. (NATIC) was honored with the American Land Title Association (ALTA) Title Industry Political Action Committee (TIPAC) Top Mid-Cap Underwriter Award for helping to raise a record amount of donations in 2017. About North American Title Insurance Co.
North American Title Insurance Co. (NATIC) is a seasoned title insurance underwriter, helping title agents achieve the goal of true business success for over 50 years. The company operates in 39 states and the District of Columbia. NATIC earned the reputation as the “underwriter next door” because its decision makers and associates are easy to reach and their processes are quick and straightforward, including a one-hour underwriting response guarantee that is unparalleled in the industry. The NATIC agency application process is fast and transparent for qualified agents. NATIC is in Peer Group 1, which groups companies with total assets of greater than $100 million as determined by Kroll Bond Rating Agency Inc., and is ranked 6th by The Performance of the Title Insurance Underwriters© in terms of cash or cash equivalents. NATIC generated more than $247 million in agency premiums in 2017 and maintains a policyholder surplus of more than $82 million as of Dec. 31, 2017.